The SkimPro Tower Adapter for above-ground pools. This is used when you have an above-ground skimmer that our regular SkimPro basket does not fit. The SkimPro Tower Adapter for In-Ground Pools. 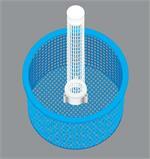 This tower system is used when you have an in-ground skimmer that our regular SkimPro skimmer basket does not fit.